I'm so glad that the weekend is almost here. It's been such a busy week at work, and I unfortunately got in a car wreck last night. I'm completely fine thankfully, but the front end of my car did not fare as well hah. However, it snowed quite a bit more overnight, so I'm getting to work from home today! I've got lots to do, but the low-key-ness is much needed. This is a super quick little post, and fortunately I snapped these pics the day before the snow and ice hit! This is a go-to casual outfit for me, and I love having a few outfits that I can throw on without a lot of thought. 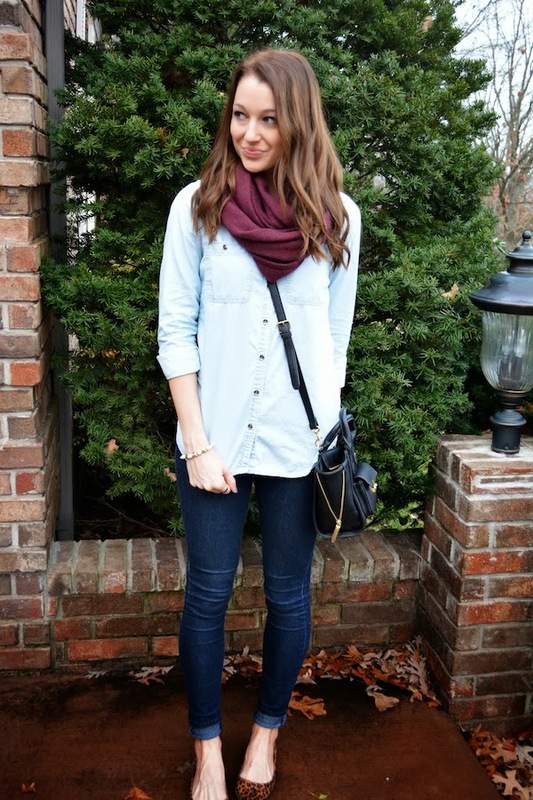 Such a cute casual outfit!! I really wished I would have gotten my hands on that bag from Target, love it! yes! TGIF! love that scarf, gotta love scarf season! Aww no Jacy, so sorry to hear that but glad to know that you are okay. I love the styling of this shirt, you have inspired me to recreate something similar. Your comment meant a lot to me...Thank you dear. So adorable!! 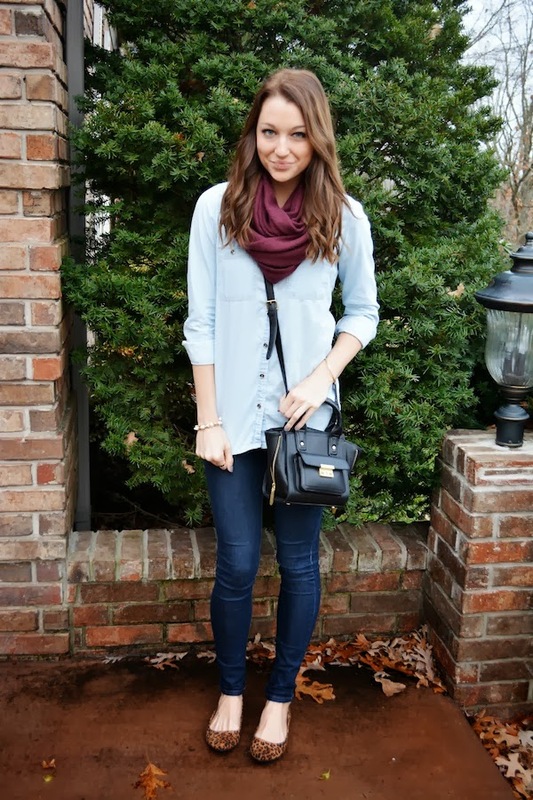 I love a good denim on denim outfit! The touch of leopard definitely tops it off! This outfit is really great & I can imagine myself wearing something similar while in University! The item I like the most, must be that burgundy scarf, I really love burgundy this season! love this look!!! I am living in my comfy scarves these days! You really nailed fall and winter this year! Go girl! And no problem girl! I loved that outfit. That's so fun & exciting!! haha love it when that happens.